In the age when Muzaffarnagar has been in the news for all the wrong reasons, Muniba Faiza is a shining example of perseverance and hardwork. She is a pride not only for her parents but also the country and community she comes from. 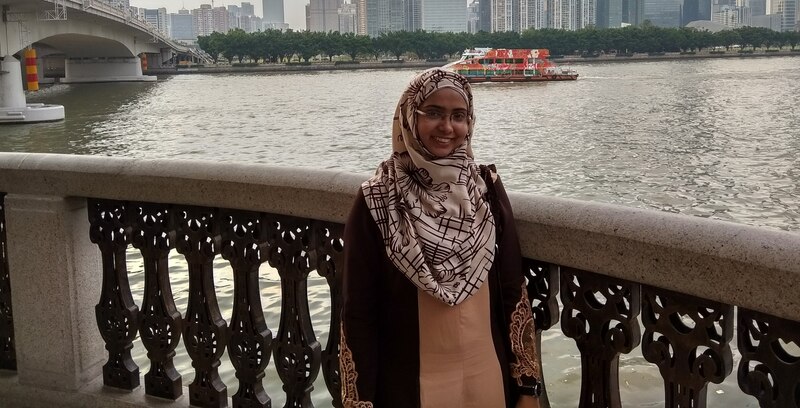 Muniba Faiza, originally from Khatauli, Muzaffarnagar is a PhD scholar (Bioinformatics) at the Department of Food Sciences & Engineering, South China University of Technology, China. Her department is ranked as world’s second best department in this field. Currently living in Guangzhou for her research, she is working on Peroxygenases. She has thrice received ‘Guangdong Provincial Government Scholarship’. She has also been awarded ‘SCUT Excellent Student Award 2017’ and ‘SCUT Excellence Scholarship’ for PhD Program (2016 to 2019). In an exclusive interview with BeyondHeadlines, Muniba talked about her career choices, experience of living in China, her interest in Bioinformatics, importance of religious and family values and much more. According to Muniba, peer pressure and societal norm usually coaxes girls to choose Arts or Commerce at higher secondary school level, probably because they could be a great teacher in those subjects but not Science. “I had to sit on a hunger strike for two days to get everyone agree with the choice that I made i.e. the Science. Biology was especially my area of interest and I stood for the choice I made”, Muniba recalls. Muniba proved her choice to be felicitous as she has published more than 8 research papers in reputed scientific journals in the areas of Bioinformatics, Enzyme & Microbial Technology, Biochemistry, and Biotechnology during her MSc and PhD. Muniba had also been college topper in Dayal Singh College, University of Delhi. Later on, she enrolled in MSc Bioinformatics, Dept of Computer Science, Jamia Millia Islamia. During her studies at JMI, she and her team were shortlisted for best innovation at IIT Roorkee and also awarded for the best research poster award at TERI University. We have heard a lot of negative views about Muslims’ treatment in China. As a resident, do you feel it is difficult for people like us to live there? To this question, Muniba replies by asserting that this is not exactly how it is. She says that survival in a foreign land becomes easy if one adopt an optimistic and confident attitude. “My experience with Chinese people has been very positive. You can see people watching Bollywood movies there, particularly I have seen so many fans of Amir Khan. Chinese people are very professional and courteous. All my colleagues are very supportive and I have never faced any prejudice against my dress code or my religion”, says Muniba. Have your hijab and Islamic values prevented you from performing your research work? To this, she replied, “No, not at all. On the contrary, it gives me confidence and people respect me for preserving my culture and upholding my family values. I work in my lab with my Hijab and nobody is bothered about that. Our lab is goal oriented and such things are insignificant in the larger world of sciences. That’s the reason why we are world’s second-best lab in Food Sciences and Engineering”. In her message to the young girls aspiring for higher studies, Muniba says, “I would say that if there are adverse circumstances, there will be favourable ones too. All you need to do is to stand firm on your aspirations and believe in what you do. If some people discourage you, you will also find encouraging ones provided you look for them. Positive outlook towards life, people and its challenges are all you need. Decide what you want to do and go for it with full confidence”. Discussing on the importance of teachers in her life, Muniba said, “I have many encouraging teachers in my life and they have provided me with great support. But when I went to my college to withdraw my admission from DU (as I faced difficulties travelling to and from college in Blue Line buses), the teacher-in-charge Mr Khan, refused to cancel my admission saying that I would go home and get married and my education would be over. Due to his concern regarding my education, he encouraged me and asked me lots of questions to make sure that I was not quitting education forever. He even offered me to come along with him every day to college if I had problems travelling to college. He is the best man I ever met and his little yet invaluable care for a girl’s education was all I needed at the moment”. Talking about her experience in Jamia Millia Islamia, Muniba told BeyondHeadlines that Jamia had become her second home. “It is JMI where I found great teachers and researchers. Teachers and environment at JMI is particularly suited for researchers who are looking for great independence and good guidance during their research”. On a question about her future plans, Muniba tells BeyondHeadlines that she plans to carry on her research work in India with a good organization after completing her PhD. “There is a lot to be done in Bioinformatics, Drug Discovery, Computational Biology and Biotechnology in general. My research interest is aligned towards computational part and I hope to make a significant contribution to this field”, adds Muniba.